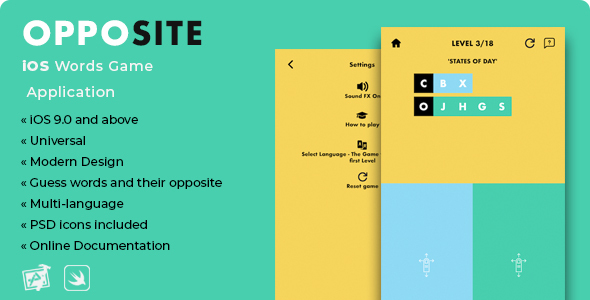 Opposite is a full-working Game Template for players to guess words and their opposites. Each level shows a hint to help players guessing the 2 words, and there’s also a button to ask help to friends by Email, SMS or social network apps. You can add as many words as you can in the code – they are simple arrays of Strings – as far as the words don’t exceed the 6 characters. This template is also multi-language, it comes with 2 pre-defined languages (English and Italian), just for demo purposes. The online Documentation explains how to add/edit words and other languages. PLEASE NOTE that this app supports only Latin languages, no special characters, no Chinese, Arabic or other similar languages.